Yuja Wang on Rachmaninov: "Every time I play his music it's... a gift!" A child prodigy, Yuja Wang discovered the piano at the age of six. A year later, she gave her first concert. Now 31, the Chinese musician is one of the most highly-regarded pianists of our time. And at the Doelen concert hall, with the Rotterdam Philharmonic Orchestra, she brought Rachmaninov's rarely-performed 4th piano concerto to life. "Listen to his music! It's the most sensuous and passionate," she told Euronews correspondent Andrea Buring. "I don't know where he got all this from. Every time I play his music it's like... a gift!" At the baton was Rotterdam's principal conductor and the incoming musical director of the New York Metropolitan Opera, Yannick Nézet-Séguin. "You're struck by the power but also by those dreamlike moments where everything drifts into the atmosphere like fireflies, those things that light up and then - pouff - it dies down immediately afterwards. For me, this concerto is full of secrets," he said. Playing the Second Movement at the piano, Wang describes what it evokes for her. "The Second Movement starts like an introduction. It’s like you went to New York in a jazz bar...actually probably LA! There's little hints and quotes from all of his other pieces. It's the Second Concerto. So really, it’s like an onion. Layer by layer, you discover what he's getting at, at a really late age." It is fragments of his whole work and stages of his life. Just before the October Revolution, Rachmaninov fled to Western Europe and then onto the United States. Yuja is no stranger to leaving home. At 14, she moved from Beijing to the US. "I visited his home in Switzerland. It was so inspiring," she said. "It has his piano which I touched and it has all the photos. That's where he got the inspiration back. He had to leave during the Second war. And he composed all those pieces when he was in America. He never went back and he probably never knew that when he left. So it is this kind of 'you never know what happens in life' -kind of feeling." 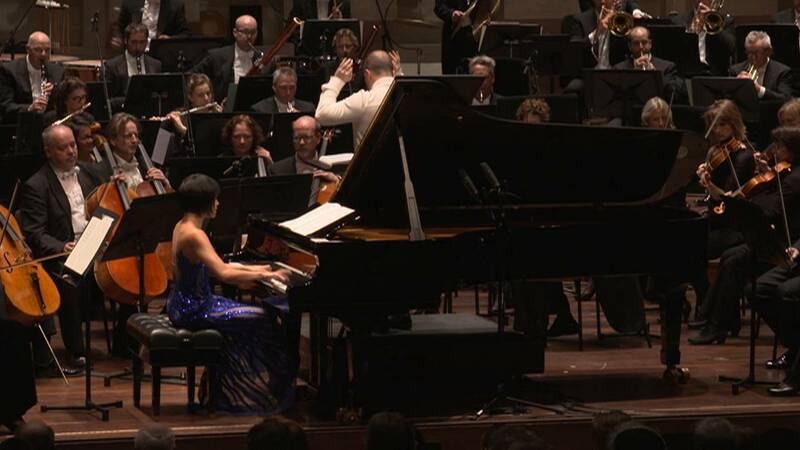 "Yuja has a lot of energy," Yannick Nézet-Séguin concluded. "The energy comes from the music, I think. When you're a musician, you want to make music, eat it, drink it, at all times. It's not a profession, it's a vocation." The conductor himself is soon set to leave the Rotterdam Philharmonic Orchestra. He will be sorely missed.